Indoor plants add natural beauty to the home. New plants may need to be potted in permanent containers, especially if the decorative containers they are in do not have proper drainage holes on the bottom. Existing plants require repotting from time to time, usually when the roots begin blocking the drainage holes, or if the plant starts to lift from the soil. Properly potting the houseplants prevents damage to the plants, while ensuring they are planted in a way that supports their survival. Re-pot into a pot that is one-third larger than the current pot the plant is in. 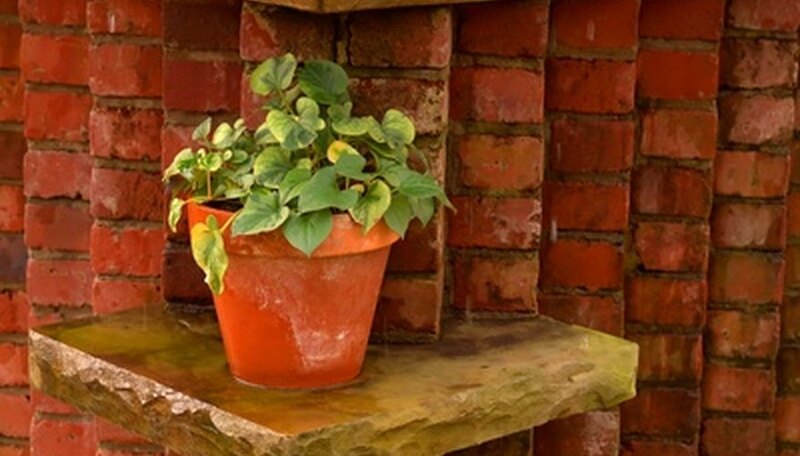 Choose a pot that has at least one drainage hole in the bottom is deep enough or slightly deeper so it can support the current soil depth the plant is potted at. Place your hand over the top of the plant with the stem passing through your fingers. Turn the pot upside down and thump the lip of the pot against a table or counter top, so that the plant slides out of the pot and into your hand. Place 1 to 2 inches of soil into the new pot. Use enough soil so that the crown of the plant sits about 2 inches beneath the rim of the pot. Sprinkle water on this soil to moisten it. Cut off any blackened or slimy roots with a sharp knife. Cut through any roots that encircle the entire root ball, as these can choke off the healthy roots and kill the plant. Set the plant into the new pot and fill around it with potting soil. Add soil until the plant is at the same depth in the new pot that it was at in the old pot. Water the pot from the top until the excess moisture begins draining from the bottom. Add more soil after watering if it is necessary due to the soil settling. Remove the top layer of soil from the root ball if it has white splotches, as these are caused by excessive fertilizer salts and can damage the plant. Do not apply pressure to the plant stem when removing it from the pot. This can damage it and lead to the death of the plant.